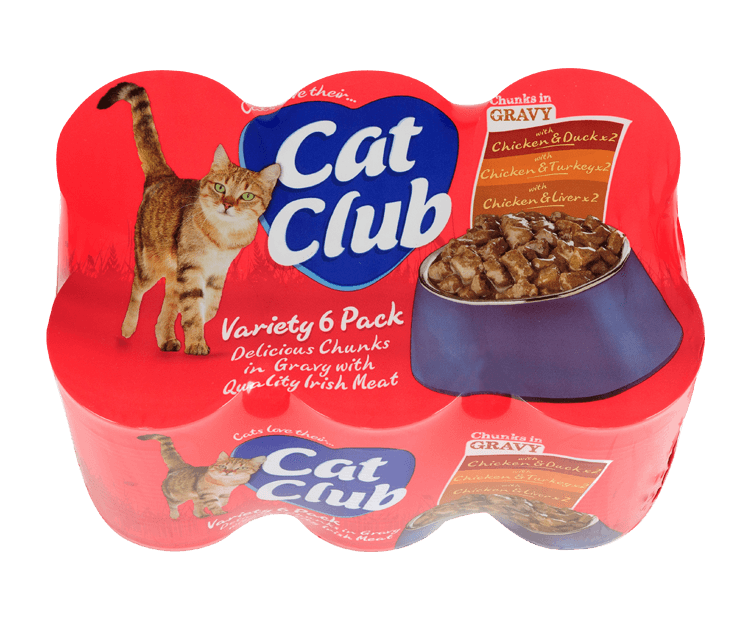 Cat Club is made from top quality, locally sourced ingredients and manufactured to the highest standards, completely satisfying your cat’s nutritional needs. Made with Irish Meat, Cat Club is fully traceable from farm to can. The success of Cat Club since its introduction in 1998 is testament to yet another quality product from Mackle Petfoods whose philosophy is to put pets first. 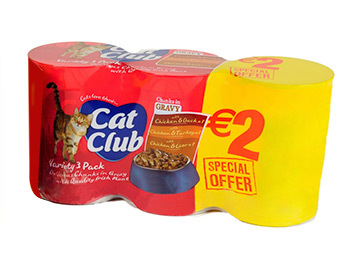 Cat Club cat food is widely available in leading retail outlets and independent pet shops across Ireland. Cats love their Cat Club! Composition with Chicken & Liver: Meat and Animal Derivatives (Minimum 40%, including 4% Chicken and 4% Liver). Composition with Chicken & Turkey: Meat and Animal Derivatives (Minimum 40%, including 4% Chicken and 4% Turkey). Each Pack contains Derivatives of Vegetable Origin, Minerals and Various Sugars. Vitamin A 5300 IU/kg, Vitamin D3 530 IU/kg, Vitamin E 7.95 mg/kg, Taurine 265 mg/kg, Zinc Sulphate Monohydrate 151.4 mg/kg, Ferrous Sulphate Monohydrate 35.3 mg/kg, Manganese Sulphate 16.5 mg/kg, Sodium Selenite 1.18 mg/kg. Calcium Iodate 0.84 mg/kg. Protein 8.0%, Fat content 5.0%, Inorganic Matter 2.5%, Crude Fibre 0.5%, Moisture 82%. Nutritionally valid until Best Before Date on can. Store in a cool dry place. After opening, keep unused contents in a lidded container, keep refrigerated and use within 24 hours. Best served at room temperature. Important: This is only a guide. Daily amounts can be adjusted to suit the level of activity and physical condition of the cat. 4kg ¾ – 1 can each day in at least two meals. All cats need access to fresh drinking water at all times. Mackle Pet Food products are available through the UK and Ireland. Contact our sales team to find out more about stocking this product.